❶. Professional Sport Smart Watch: exercise tracking, Calorie count, Heart rate calculating, sleep monitoring and more other functions. This watch would be your professional assistant in your sport & fitness. Charge needed. ➋. BEST SERVICE WARRANTY from BRIGADA: 45 days 100% money back guarantee & 2-year replacement warranty. Get This Professional Sport Smart Watch Now & No Cost to Try. ➌. 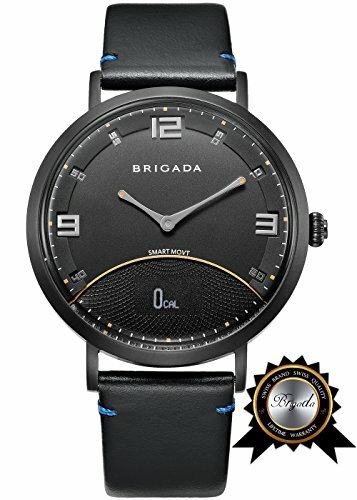 HIGH QUALITY WARRANTY from BRIGADA: consummate smart movement & Android/ios smart APP, leather band, 316L stainless steel case. High Quality & 1-year replacement warranty! ➍. Improve Temreramant, Fitness Wear or A Great Gift: attend party, date, wedding, any business or casual occasions; exercise fitness wearing for yourself; birthday gift, anniversary gift, Christmas gift - to families, lover or friends. ➎. Honest Review Plan: Leave your honest review for your previous B's bought (no matter good / bad, long / short) get 40% free for your next B's bought. If you have any questions about this product by BRIGADA, contact us by completing and submitting the form below. If you are looking for a specif part number, please include it with your message.